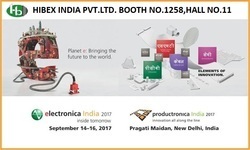 There are plenty of good reasons to attend productronica India. It will give you a broad overview of the entire electronics production industry and give you new drive for your business success. We are demonstrating recent development in assembly automation. We will be displaying Janome Screw Tightening Robots, Dispensing robots, Con formal coating robot, PCB Depbelling robot, HIos Pulse counting screw drivers, screw feeders etc. PLEASE VISIT US AT BOOTH NO 1258, HALL NO 11.